Goodwill NYNJ CEO/President Katy Gaul-Stigge (third from left) and Ernie DuPont, Senior Director of Workforce Initiatives for CVS Health (second from right), with the CVS Health Workforce Initiatives NYC Regional Learning Center team. 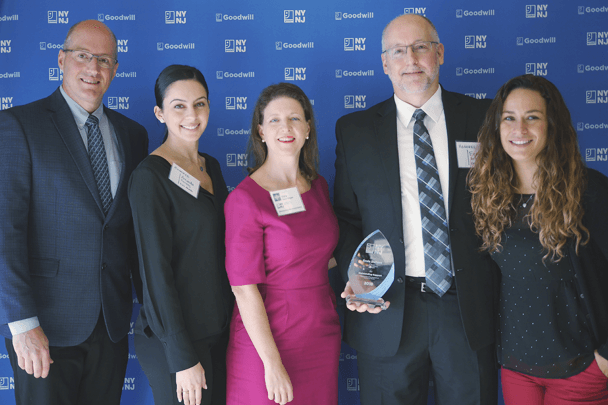 CVS Health was named 2018 Employer of the Year by Goodwill Industries of Greater New York and Northern New Jersey (Goodwill NYNJ) for being a leader in the vision to create a world with no employment barriers for individuals with disabilities. Presented during Goodwill NYNJ's 2nd National Disability Employment Awareness Month (NDEAM) ceremony on Friday, October 19, in New York City, the award recognized the ongoing collaborative efforts of Goodwill NYNJ and CVS Health to foster work opportunities for individuals of all abilities. For the past several years, Goodwill NYNJ has partnered with CVS Health’s New York City-based Regional Learning Center (RLC) to create customized job training, resulting in more than a dozen people being placed at CVS Pharmacy locations across New York City, including Sharon Cooper, a Goodwill NYNJ program participant and current CVS Pharmacy colleague who was honored with the 2018 NDEAM Employee Honors Award. Ernie Dupont, Senior Director of Workforce Initiatives for CVS Health, accepted the award at the ceremony. "At CVS Health, we understand the importance of helping individuals with disabilities access the security and prosperity that stable jobs can provide," said Dupont. "We are honored to be recognized for our commitment to creating a more inclusive workforce, and look forward to helping more colleagues like Sharon Cooper find a meaningful career with CVS Health." CVS Health has a number of initiatives in place to ensure that the company’s workforce reflects the diversity of its customers and the communities we serve, including training and development programs aimed at individuals with disabilities. In recognition of those efforts, CVS Health has received a perfect score on the Disability Equality Index's "Best Places to Work" index for the past two years for disability inclusion and equitable best practices in the workplace.